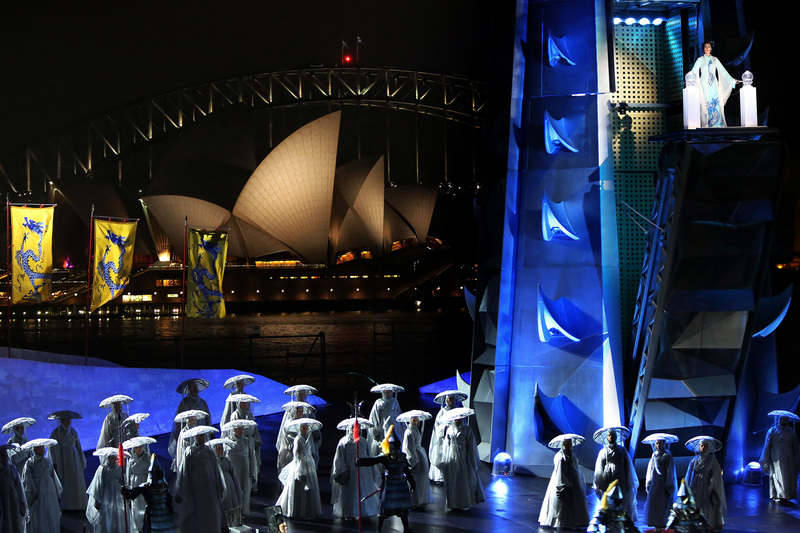 Now in its fifth year, Opera Australia would seem to have perfected the presentation of Handa Opera on Sydney Harbour as a Major Event. This year’s offering, Turandot, is intelligent, lavish, slick and musically superb. 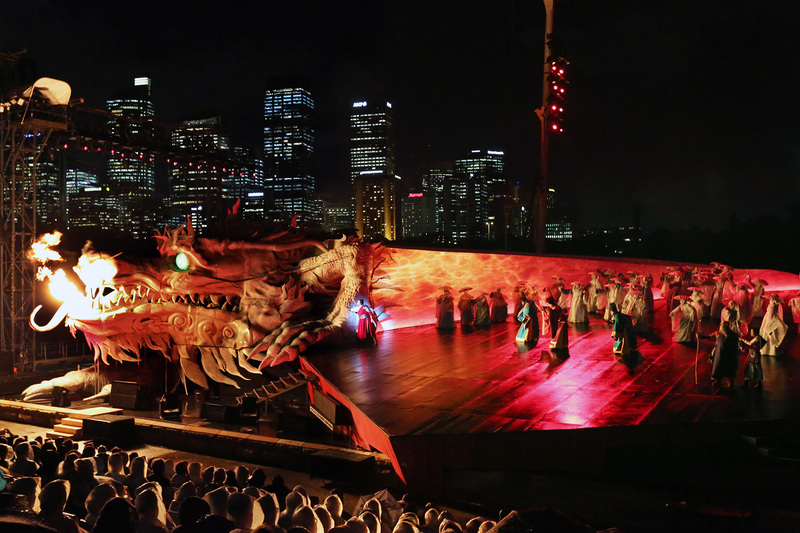 While Destination NSW tries to send out the message that certain musicals are exclusive, Handa Opera on Sydney Harbour truly is an Only In Sydney event. This may not be the only outdoor opera in the world, but the location is truly unique. Just entering the custom-designed site feels special, with the city skyline, Harbour Bridge and Opera House creating a backdrop more stunning than any designer could possibly create. 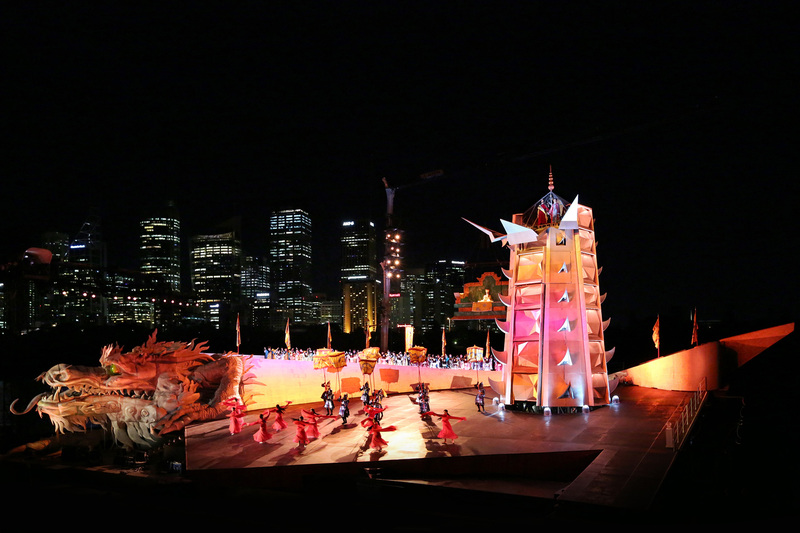 Turandot designer Dan Potra has made excellent use of this site-specific landscape. 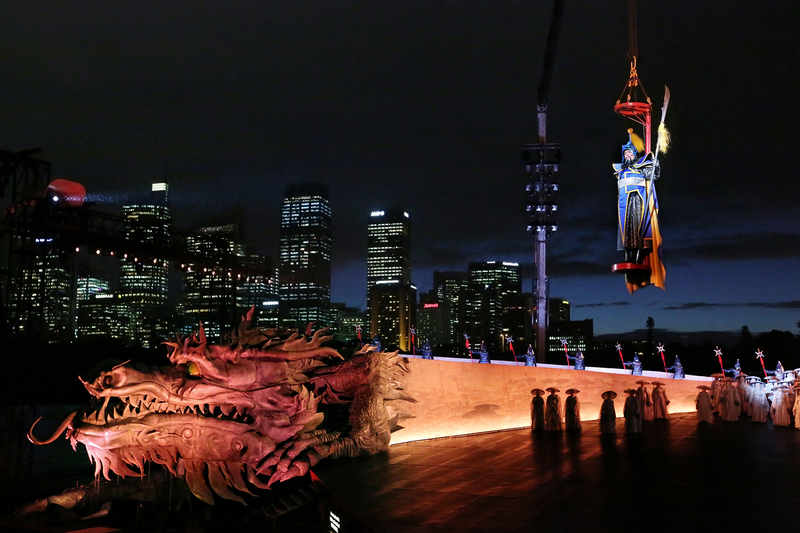 The perilously raked stage rises up to the dragon’s tail, representing the Great Wall of China, with the glittering cityscape still clearly seen in the background. Even Princess Turandot’s gleaming pagoda, studded with talons as spiky as her personality, sits in line with the height of city buildings in the distance. The abundance of space in all directions give lighting designer Scott Zielinski scope to include a myriad of lights, which continually and extensively evolve with the mood of the opera. This is the first Handa Opera to make use of projections, benefitting from the sophisticated design of Leigh Sachwitz. Given the vast distance from the projectors to the dragon’s tail, the animated projections are impressively sharp and clear. Indicating the level of collaboration within the creative team, Potra’s costumes for the villagers are of a flat silvery material that serves as an additional canvas for the projections. 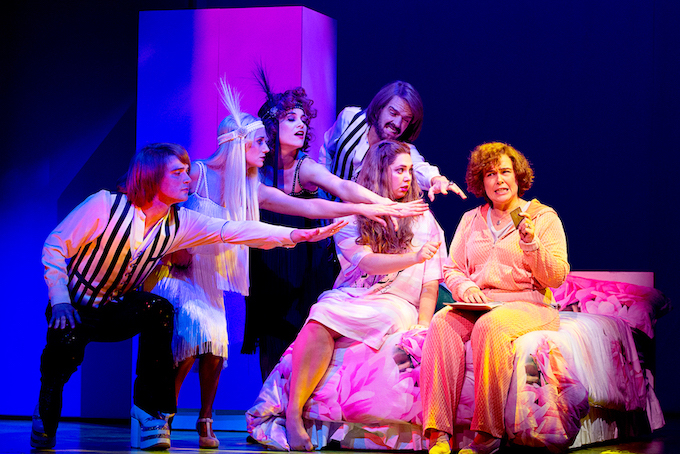 Costume choices are on a grand deal without being quite as outlandish as some of those seen last year in Aida. The movements of Ping, Pang and Pong make very good use of their boldly coloured, sweeping garments. 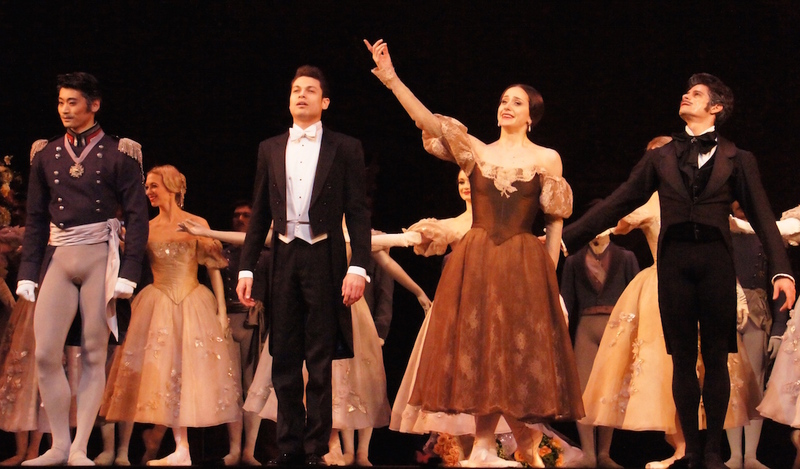 The female dancers, likewise, make lovely use of long draping cuffs on their sleeves. Gleaming blue paneled military garb is particularly attractive. While each of the lead performers is well served with a highly distinctive costume that clearly identities their role, the fact that the lead characters bear no similarity to any chorus characters seems an odd choice as they are all meant to be from the same world. Edited for length, but not egregiously, the performance satisfies lovers of Puccini’s music while also providing a user-friendly running time for beginners or social operagoers. The 35-minute interval provides ample opportunity to enjoy custom hospitality, if one’s budget stretches that far, or take a closer look at the mighty dragon’s head or just enjoy the magnificent view as showcased by the highly creative site design by Adrienn Lord. Shi-Zheng tells the dramatic fairy tale in bold, clean strokes. The timeless setting suggests the vast history and fine cultural accomplishments of China. Turandot is often seen as icy, but her imperious actions here are tempered with the understanding that she is trying to protect her family’s rule from an interloper. 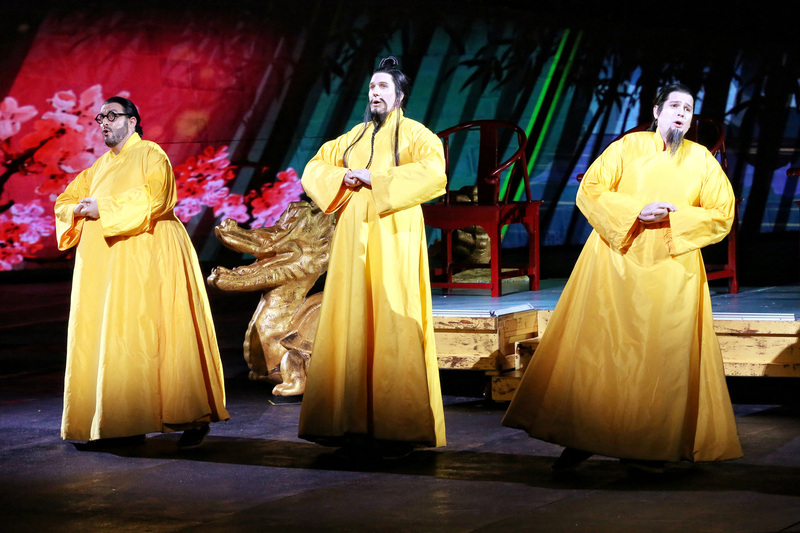 Rather than be carried away with spectacle, Shi-Zheng uses the large-scale production elements, huge chorus and lively troupe of dancers to judicious effect. The tightly drilled dancing is choreographed by Shi-Zheng. In his fifth outing as Handa Opera conductor, maestro Brian Castles-Onion keeps the action humming along with brisk tempi. Presiding over a massive number of musicians and singers, Castles-Onion’s rock solid musicality and his flair support his unflinching leadership. Tony David Cray’s sound design capably transmits the fine playing of the Australian Opera and Ballet Orchestra, particularly the harp and the percussive bells and chimes. Chorus preparation, by Anthony Hunt, is reliably excellent. The unisex flowing robes for the chorus create an interesting effect as the singers all look very similar yet all voice types are heard. Given that outdoor amplified singing is not the primary focus of an opera singer’s career, Handa Opera has again attracted a top cast, each of whom is working at their premium level. Amplification occasionally works against vocal dynamics, but reproduction of tone and expression is excellent. The performance is enhanced by the raked stage and raked seating creating a close connection between singers and audience. For example, it can be clearly seen which of Luke Gabbedy, Benjamin Rasheed and John Longmuir are playing Ping, Pang and Pong. Each of these three sings with precision and expressive colour, and their animated reactions of outrage and disapproval are most amusing. Appearing relatively late in the opera, after most characters have been established, any Turandot must strive to make her mark as the title character of the piece. Serbian soprano Dragana Radakovic makes a sensational entrance from a tilting arm high in her spiky pagoda. Singing with unwavering power and focus, Radakovic conveys the steely determination of a young woman who is forced to keep society at an unfriendly distance. Radakovic later allows a wave of warmth to melt the ice when Turandot is outwitted by Calaf. Imposing tenor Riccardo Massi is in powerful voice as the brave and, fortunately, intelligent Prince Calaf. Singing with equal strength across his register, it is clear early on in the night that “Nessun Dorma” is going to be quite the showstopper, and Massi’s soaring rendition certainly lives up to this promise. The combined power of Massi and Radakovic brings compelling force to the final sequence, written by Alfano after Puccini’s untimely death, which can potentially fall flat after the integrated splendour of the choral and principal singing from the rest of the opera. 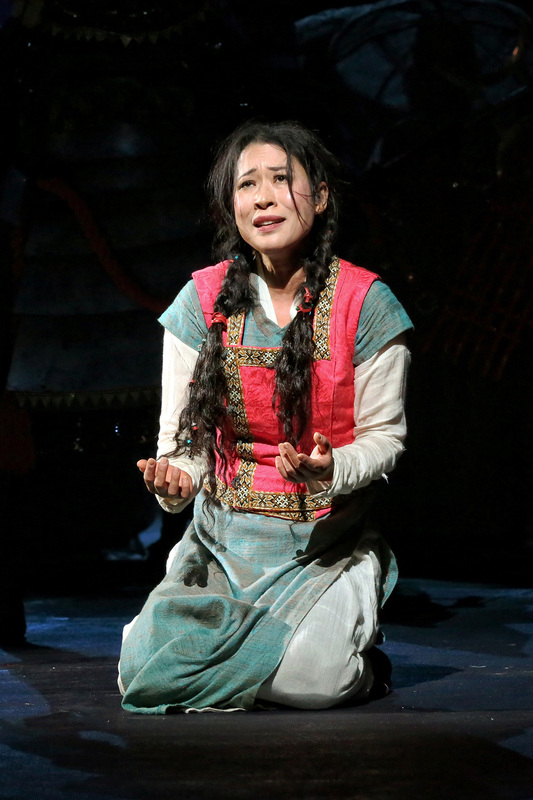 Hyeseoung Kwon gives an endearing performance as plucky slave girl Liù. Dressed in masculine-looking survival wear, Kwon’s beautiful singing allows the full femininity and vulnerability of Liù to pour forth, engaging the audience in the dear girl’s plight. Kwon effectively conveys the pain and indignity of torture, leading to a moving final moment for the character. Conal Coad also gives a sympathetic performance as the fragile Timur. Unfortunately, Coad is robbed of Timur’s powerful aria, ” Liù, Liù, sorgi!” which usually provides a moment of solemnity after Liù’s death. David Lewis lends his authoritative tenor voice to the uncompromising Emperor. 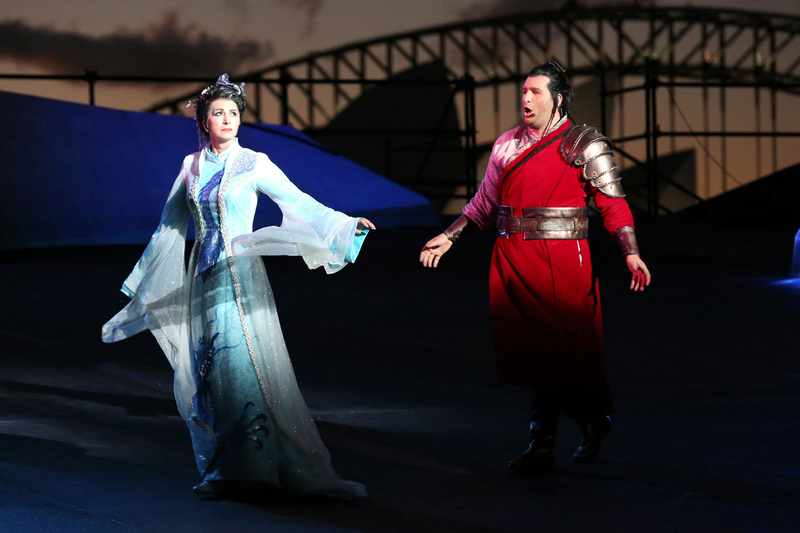 Turandot was reviewed 16 April 2016 at Fleet Steps, Sydney where it plays until 24 April 2016. Will DEFINITELY be making an effort to come down under and see one of these one year, they look amazing! 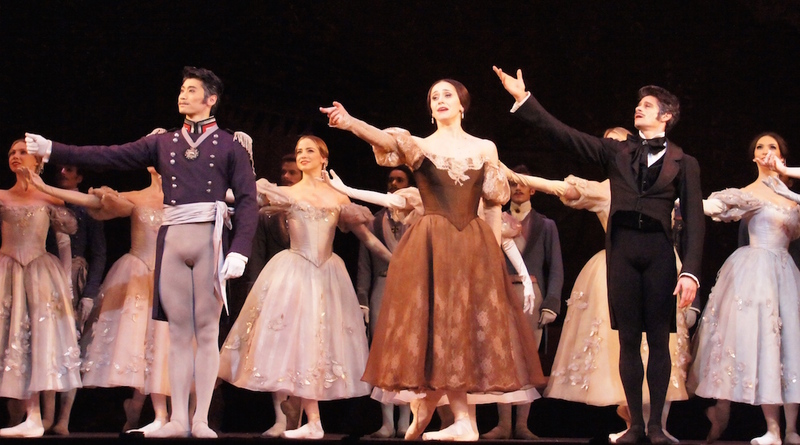 These operas run a full month with an alternating lead cast so there are plenty of opportunities to see them. Would be a great highlight of a trip down under!